I am going this afternoon to conduct the funeral of a 94 year old man. I asked him a few weeks ago, “Mike, who is the first US President that you remember?” He said, “Warren G. Harding.” Harding was President from 1921 -1923! This puts some things in perspective for me. Mike lived 94 years, an incredibly long life on this earth. But 94 years compared to eternity in heaven with God … a blink of the eye. Mike is in heaven, I have no doubt, having a great time today. We received word on Friday that the County Parks and Recreation Department will no longer allow us to conduct worship services at the park, where we have been enjoying our Sunrise Beach Service for several years. Each Sunday morning at 7AM, dozens of people gather to sing, pray and share the Word of God. Because of some scheduling problems, we have to relocate our service or meet later in the day. Later in the day does not work for me because of our worship service schedule at the main campus. Our option seems to be to find another place where we can worship. Picket the Parks and Rec Department? Call the local news reporter? I am hoping that we can assume a position of “turning the other cheek”. We wish to be at peace with our County leaders. We want to work with them, along-side them to bring positive change to our community. We want to model a Christ-like attitude as we face this situation. We are looking for alternative places of worship. I have to say, this minor inconvenience has caused me to wonder what it is like to have government oppression against our religious practices. How would it feel if worship were made illegal? How would underground worship happen in our community? What do our brothers and sisters in Christ who live in oppressed conditions experience daily? Is this the first step to the government taking away our freedom of religion and rights to worship? Possibly. Are we going to get in a panic about it? No. I would rather spend my time ministering to people than fighting with community leaders. Besides, we have been breaking the rules all along. The park is clearly posted: “Park opens at dawn and closes at dusk.” We are there way before dawn on most Sundays. Say a prayer with me about perspective. We need to see these things the way Christ does. I am expecting growth to come from this. I think this challenge may result in something positive. Honestly, I can’t wait to see what God does with this one! Most people are too skeptical to believe in a new beginning. Fresh beginnings are only for sports teams at the start of a new season. I think that: 1) past failures and, 2) the myriad of “friends” who surround us to let us know that optimism is for dummies is enough to squash right out of us any shred of hope for positive. But God has different ideas. Next Sunday at Maranatha, we will jump into the concept of New Life in Christ. Life Swap will be a four-step “walk through” of how God brings real transformation to our lives. Week one will zero in on how Jesus offers a new beginning to anyone who asks. Each week we will will build on a biblical theme of redemption and renewal. If you would like to receive an e-invite that you can pass along to someone, email lwhitter@maranathachurch.org. 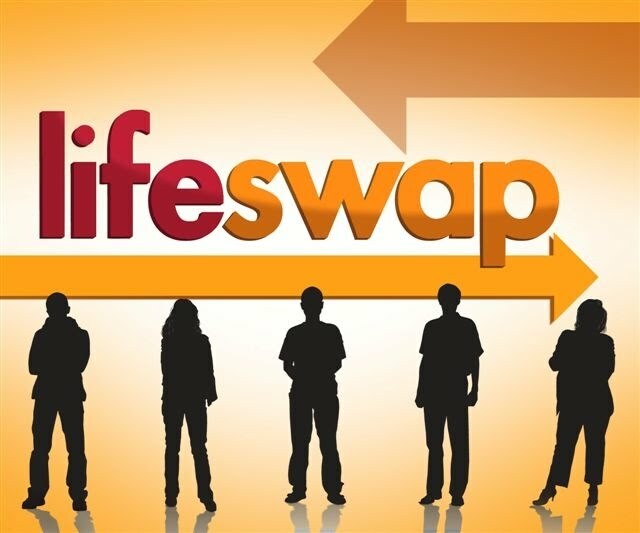 Life Swap – don’t miss it! Tomorrow, I plan to put the vision that is in my heart out there for everyone who cares to listen. This doesn’t feel risky to me, it is exhilarating. I am not too concerned about whether people like it or not. I do hope that there is “buy in”, but I know what God has said to me about His kingdom work in my sphere of responsibility and I am fired up to share it. I won’t be defensive, I won’t be insensitive. I will be straightforward. If you are coming to Maranatha tomorrow, please come with an open heart. If you aren’t coming, good luck with the translation to audio or video – it just isn’t the same! We are making plans for a life-changing missions trip. During Thanksgiving week, my family, along with most anyone else who is qualified, will travel to Guatemala to help some very needy children. There are two major events for this trip. 1) We will feed, minister to and provide shoes for 200 very poor children in Rio Bravo, Guatemala. These children are literally starving without outside assistance. Most of them are barefoot which contributes to various health issues. 2) We will cook and serve a traditional North American Thanksgiving meal to the orphans who live at Casa Shalom. If you are interested, there is a lot of info about the trip on our church website. The sign up deadline is October 4. If you can’t go, you can send. Please watch the video in the post below.